The final b.o. figures won't be reported until Monday, but preliminary estimates suggest that Happy Feet, not Casino Royale, will claim bragging rights for the No. 1 spot this weekend. 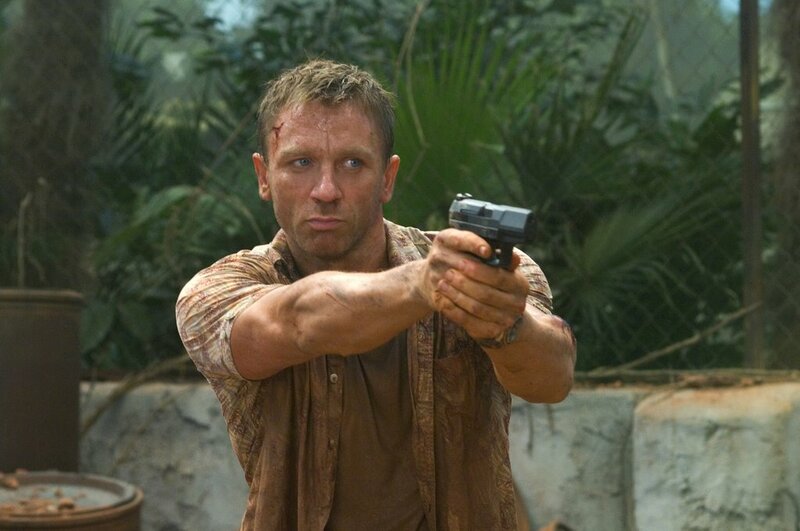 With a minimum of high-tech gadgetry and a maximum of hand-to-hand, fist-to-face, club-to-balls rough stuff, Casino Royale is hugely satisfying and impressively exciting, beginning with an ice-cold black-and-white sequence that has James Bond earning his license to kill, careening through some sensational action set pieces (including a spectacular confrontation on an airport runway, and an ingeniously sustained foot chase throughout Madagascar), lingering on some smoothly (and cleverly) suspenseful card games at the title locale -- poker, not baccarat, is 007's game of choice here -- and climaxing with a thrilling image of Bondian iconography. My only real complaint is directed at the saggy pacing in the last half-hour or so: There's too much time spent on an obviously doomed romance between Bond and fetching femme fatale Vesper Lynd (Eva Green) after the chief bad guy is dispatched. (So much time, in fact, that even the dimmest bulb in the audience will have long enough to realize that, hey, Something Else is bound to happen before the closing credits.) Otherwise, a great reboot for the series, a welcome treat for long-time fans, and a terrific introduction for newcomers to the 007 mythos. I'm a little late commenting on this but I just saw Casino Royale last night. The cool retro graphics for the opening credits and the black & white sequence showing pre-007 Bond got things off to a good start. I was also quite impressed early in the film by the hyper-kenetic foot chase scene. I had been wondering when we'd see the influence of parkour in a major film and here it is, done to great effect. Wow! I predict we'll be seeing plenty more of this in other films. There are other things I like about Casino Royale, too, chief among them being Judy Dench and her role. But the film is too long and too heavy on the action sequences for me; they just get tiresome after a while no matter how well done. Maybe that's why this still comes across as very much a guy film despite showing off Daniel Craig's bod. It is also too light on the Bondian wit and charm. Having said that, I am still pleased that this Bond movie is more gritty than pretty.